With its unique location deep within the magnificent Daintree Rainforest, there’s an abundance of things to do both in and around the Daintree. The region has some beautiful landmarks that are a must see during your stay whether you wish to simply explore in the comfort of your own car at your own pace, take a tour of the areas surrounding the lodge or try your luck at some of the more adventurous activities available. We have listed the top places to visit and experiences to ensure you get the most out of your visit. There is sure to be an adventure for everyone. Whilst there are many things to see and do in the Daintree Village, a lot of the experiences are a short drive from the Ecolodge. It is recommended to have your own car however, our staff can arrange tours which pick up and drop off to the property if that is your preferred way to travel and explore. Visiting the Great Barrier Reef is a must when visiting our region. Tick two natural wonders off your bucket list in one trip. The Great Barrier Reef is the largest living thing on Earth and is even visible from outer space. The 2,300km-long ecosystem comprises thousands of reefs and hundreds of islands made of over 600 types of hard and soft coral. It's home to countless species of colourful fish, molluscs and starfish, plus turtles, dolphins and sharks. Enjoy charters to nearby islands, fishing, snorkelling and scuba diving adventures. Home to the Daintree Ecolodge, the Daintree Rainforest is an estimated 125 million years old, and the oldest tropical lowland forest in the world, the Daintree’s positioning alongside the Great Barrier Reef makes it the only place in the world where two UNESCO World Heritage Sites meet. The unique climate and history of the Daintree has resulted in the highest concentration of endangered plant and animal species that are rare or threatened by extinction than anywhere else in the world. Situated in the heart of the Daintree Rainforest the offers sustainable luxury in a unique location. The perfect base to explore the region beyond the rainforest, after a long day of adventure come back to your rainforest oasis, relax, unwind and indulge the senses with fresh seasonal cuisine, succumb to a rainforest spa treatment, or zen out with a morning yoga session deep in the rainforest canopy. The property boats majestic Bull Kauri trees, a private waterfall and dedicated walks. The perfect destination to reconnect with nature and the people you love. Visit the picturesque township of Mossman by car, nestled at the foot of the mountains surrounded by green fields of sugar cane. There are many things to do in the town; art galleries, historic pubs, country stores and the Saturday Markets where you can sample some of the local produce. 5 minutes west in the southern part of the World Heritage Listed, Daintree National Park, is Mossman Gorge. Take in the beauty of pristine rainforest, cool streams, towering mountains and the dramatic Gorge. Home to the Kuku Yalanji people, this is one of the few places in the country visitors can gain an insight into the lives, culture and beliefs of Australia’s Indigenous population and their connection to the natural environment. Located 45 minutes south of the lodge is Port Douglas, a small seaside town with plenty on offer for holiday makers. Soak up the sunshine on Four Mile beach, stroll along the main streets’ shops and galleries. Taste the tropics at one of the many fine restaurants. Visit the seaside Sunday markets or visit a rainforest wild life centre. 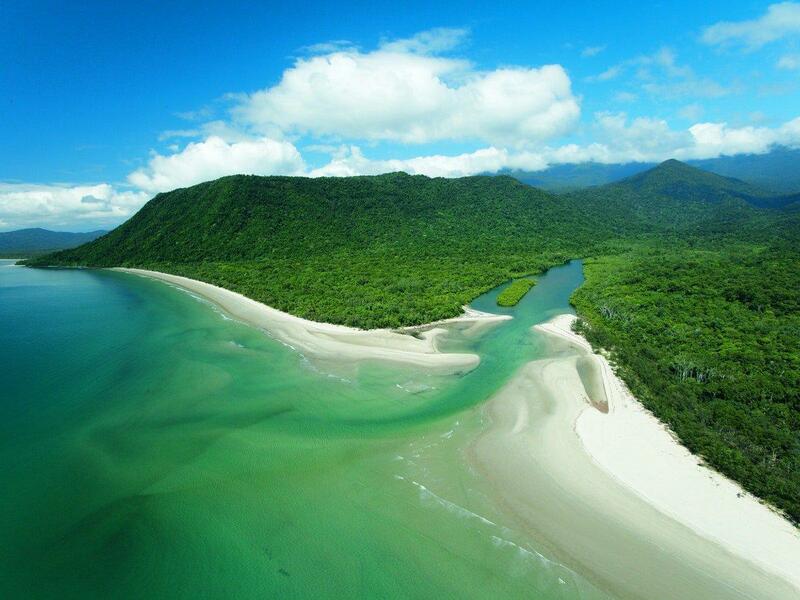 We recommend all our guests travel north of the Daintree river and up to Cape Tribulation. It is an area of stunning natural beauty and the only place on earth where two World Heritage area’s meet, the rainforest and the reef. Meander along rainforest boardwalks and stroll along deserted tropical beaches. Cape tribulation hosts some of the best adventure tours in the area. An intimate 5 course degustation menu in a romantic rainforest setting. The innovative menu features the fresh tastes of the Daintree and surrounding areas to provide diners with an experience unique to the Far North Queensland area. Pair each course with matching wines to elevate the culinary encounter. Bookings are essential. Whether you prefer to snorkel, cruise, sail or scuba dive, there are many operators that depart from Cape Tribulation or Port Douglas Marina. Alternatively, view the reef from a glass bottom boat or take an unforgettable helicopter flight and see the beauty of the reef from above. Trips vary from a few hours to a full day.